Foxwoods Resort Casino 301 to be held Sunday, July 22, 2018 as part of a multi-year agreement with NHMS. Foxwoods Resort Casino, home of "The Wonder of it All" and New Hampshire Motor Speedway have teamed up to bring a little extra wonder to "The Magic Mile" in Loudon, N.H. The two New England destinations have joined forces for a multi-year entitlement partnership naming the July 22 Monster Energy NASCAR Cup Series race the "Foxwoods Resort Casino 301." "This is just the beginning of a wonderful new partnership with the region's most popular destination resort," said David McGrath, executive vice president and general manager of New Hampshire Motor Speedway. "Foxwoods Resort Casino will help deliver high-speed fun to our facility, providing unforgettable experiences our fans will love. This is a win for the racing industry and our fans." In addition, the two partners will explore other entertainment opportunities for fans beyond sponsoring New England's largest and most exciting annual sporting event. "Uniting with New Hampshire Motor Speedway was a natural alignment for Foxwoods given our history of creating unique and exciting experiences," said Foxwoods Resort Casino president and CEO Felix Rappaport. "The amplification of our partnership will allow us to continue to deliver on that promise giving our New England racing fans sought-after thrills infused with a new twist." This is an extension of a successful relationship that began in 2017 when the two companies became partners with a ticket incentive program that awarded fans who renewed tickets on July race weekend with a free overnight. We're continuing that incentive plan this year, but with added bonuses. Additionally, during last year's September race weekend, Foxwoods Resort Casino announced On Track Karting, a new high-performance, European-style indoor karting experience set to open this summer. "It only takes a few moments on property here to see the possibilities of this partnership," said Speedway Motorsports president and CEO Marcus Smith. 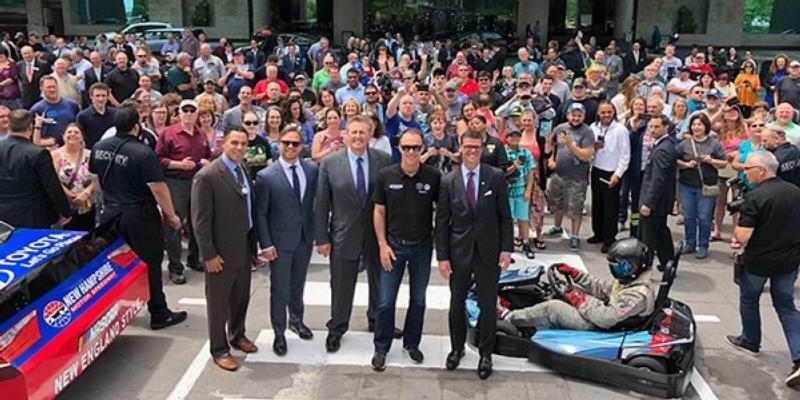 "This is a natural partnership of two entertainment brands, Foxwoods Resort Casino and Speedway Motorsports Incorporated." Monster Energy NASCAR Cup Series' hottest driver and 2014 series champion, Kevin Harvick helped make the announcement earlier today outside of the Grand Pequot Tower at Foxwoods Resort Casino. Harvick is a three-time winner at NHMS. "This is an exciting day for New Hampshire Motor Speedway and for fans of racing here in New England," said Harvick. "It's also a great day for the Cup drivers, because this reinforces the fact that the future of NASCAR is bright." Following the announcement, McGrath, Rappaport, Smith and Harvick, accompanied by his son Keelan, took a victory parade lap around Foxwoods Resort Casino's property to greet fans who came out to hear the big news. The excitement followed them right over to the top of Fox Tower, where McGrath, Rappaport, Smith and Harvick were harnessed in and raced down the zipline. Since 1992, Foxwoods Resort Casino has offered guests The Wonder Of It All as the premier resort destination in the Northeast. As the largest resort casino in North America, Foxwoods offers a vast array of gaming in six casinos; AAA Four-Diamond hotels, restaurants from gourmet to quick service, world-renowned spas, award-winning golf, state-of-the-art theaters, exclusive retailers and free-to-play casino games at FoxwoodsONLINE.com. Perfect for both recreation and business, Foxwoods provides modern and versatile convention and meeting space to infuse new life into any meeting or event. Foxwoods Resort Casino is owned and operated by the Mashantucket Pequot Tribal Nation. For a comprehensive look at Foxwoods Resort Casino and Mashantucket Pequot Tribal Nation, visit Foxwoods.com.